This empirical research investigated the future outlook of Nigeria economic development in the light of slow global economic recovery and global financial developments using long-run and short-run [Error correction model (ECM)] regression models. The study made use of annual time series data covering Gross domestic product (GDP), agriculture, industry and services sectors which spanned from 1990-2012. The findings showed that these variables have long-run association and the GDP was found to establish long-run equilibrium with these economy drivers, though the convergence rate was very slow as indicated by the attractor coefficient. Furthermore, findings showed that all the economic indicators exert positive influence on GDP with agriculture sector having a lead influence when compared to the other economic indicators. Therefore, the study recommends that government should adopt adjustment strategies that hinges on shoring-up non-oil revenues to compensate for the dwindling oil revenues given that the prospect for the country economy depend on the policies articulated for the medium-to-long term and the seriousness with which they are implemented. The concept of economic development has been in existence in the west for centuries and has been frequently used by the economists, politicians, and others since 20th century. The term refers to economic growth accompanied by changes in output distribution and economic structure-concerned with quality improvements, the introduction of new goods and services, risk mitigation and the dynamics of innovation and entrepreneurship. Whereas economic development is a policy intervention endeavour with aims of economic and social well-being of people, economic growth is a phenomenon of market productivity and rise in (GDP). Consequently, as an economist Amartya Sen points out, “economic growth is one aspect of the process of economic development”. The economic aspirations of Nigeria have remained that of altering the structure of production and consumption patterns, diversifying the economic base and reducing reliance on oil, with the aim of putting the economy on the part of sustainable, all-inclusive and non-inflationary growth. The implication is that while rapid growth in output, as measured by the real gross domestic product (GDP), is important, the transformation of the various sectors of the economy is even more critical. This is consistent with the growth aspirations of most developing countries, as the economy structure is expected to change as growth progresses. Since independence, successive governments in Nigeria have pursued the goal of structural changes without much success. The growth dynamics have been propelled by the existence and exploitation of natural resources and primary products. Initially, the agricultural sector, driven by the demand for food and cash crops production was at the centre of the growth process, contributing 54.7% to the GDP during the 1960s. The second decade of independence saw the emergence of the oil industry as the main driver of growth. Since then, the economy has mainly gyrated with the boom burst cycles of the oil industry. Government expenditure outlays that are dependent on oil revenues have more or less dictated the pace of growth of the economy. Looking back, it is clear that the economy has not actually performed to its full potential, particularly in the face of its rising population. The economy of the country has grossly underperformed relative to her enormous resource endowment than her peer nations despite its natural and human resource potentials: its economic performance has been rather weak and does not reflect these endowments. When compared with the emerging Asian countries, notably, China, India, Malaysia, Indonesia and Thailand that were far behind Nigeria in terms of GDP per capita in 1970, these countries have transformed their economies and are not only miles ahead of Nigeria, but are also major players on the global economic arena. Where, pit is the price in market i at the time t, Δpit (pit – pt-1) and α is the intercept or trend term. Where, εt ~ WN(0, σ2), and WN indicates white noise. The integration parameter d is a non-negative integer. When d = 0, ARIMA (p, d, q) = ARMA (p, q). The regression of a non-stationary time series on another may cause spurious/nonsense regression as evidenced by the coefficient of multiple determination R2 (0.9987) which was greater than Durbin-Watson statistics (0.9909) as shown in Table 1a. A spurious/nonsense model is not desireable given that it is not ideal for policy making and cannot be used for longrun prediction. Furthermore, a unit root test on the residual variable at level generated from the simple regression (Equation 1) was found to be stationary as indicated by the ADF τ-statistics which was greater than the Engel-Granger critical value at 5% significance level (Table 1b), implying that the double logarithm simple regression model is not a spurious regression, thus a long-run model which can be use for ideal policy making and long-run prediction. Also, the stationarity of the residual variable implies that all the variables included in the model were cointegrated i.e these variables have long-run association or they move together in the long-run-these variables shared the same stochastic trend. Furthermore, a perusal of Table 1a shows that all the predictor variables included in the model viz. agricultural, industry and services sectors significantly influence the country GDP positively in the long-run. For ideal policy making it implies that 100% increase in the revenues that accrue to each of this economy driver’s viz. agriculture, industry and services sectors will increase the country GDP by 47.4, 35.6 and 13.3%, respectively. Table 1a. Results of simple regression showing long-run effects. Table 1b. ADF unit root test on residual. If variables are found to be cointegrated we can specify an error correction model (ECM) and estimate it using standard methods and diagnostic test. Also, since these variables were found to be integrated in the long-run i.e there is co-movement or long-run association between these variables, they are likely to establish long-run equilibrium, thus, the need to model a short-run equation which will capture both the long-run and short-run equilibriums. The results of the unit root test applied to the transformed variables at level using ERS (Elliot-Rothenberg-Stock) rejected the alternative hypothesis of stationarity in favour of the null hypothesis (non-stationarity) as indicated by the estimated t-statistics which were higher than the t-critical value at 10% significance level. At first difference the unit root test performed on all the transformed variable series rejected the null hypothesis of non-stationarity in favour of the alternative hypothesis (non-presence of unit root) as shown by the estimated t-statistics which were lower than their respective t-critical values at 5% significance (Table 2a). In summary, the ERS unit root test indicated that all the variable series at level where non-stationary i.e have unit root, but at first difference all the variable series became stationary i.e no unit root present, thus, meaning that these variables were integrated of order one. The reason for the application of the ERS (Elliot-Rothenberg-Stock) test also termed ADF-GLS test against the ADF test which is the most widely and commonly used unit root test was due to Type II error inherent in the estimated ADF test results (though not reported in the Table) which clearly proved that the ADF test had lost its power to test for stationarity due to the presence of structural points (SAP and post-SAP periods) in the captured data. It is worthy to note that  as cited by [11,12] advocated that all the traditional unit root test models (DF, ADF and PP tests) should be discarded because of their weaknesses which cause Type I and II errors. The results of the short-run model which capture both the long-run and short run equilibrium is shown in Table 2b. The attractor coefficient termed the error correction term (ECT) of the GDP against the economy driver sectors was found to be negative sign and significant, indicating that the GDP established a long-run equilibrium with all the economy driver sectors. The estimated attractor coefficient of the GDP was -0.278, indicating that the GDP absorbed 27.8% of the shocks in order to maintain a long-run equilibrium per annum i.e it corrects its previous error from the long-run equilibrium due to any shock from short-run equilibrium at the speed of 27.8% annually, which will take approximately 8 months and 10 days for GDP to re-establish long-run equilibrium. Therefore, it can be inferred that there was long-run causality running from the economy driver sectors jointly to the GDP. However, the speed of convergence of the GDP towards the long-run equilibrium level with the economy driver sectors was very slow, and this can be attributed to inefficiency of the reform programmes in the country. The results of the short-run equilibrium show that each of the sectors viz. agriculture, industry and services sectors has short-run causal effect on the GDP. In other words, the agriculture, industry and services sectors positively influence the GDP in the short-run. The implication is that a 100% increase in the sectoral revenue of agriculture, industry and services will increase the GDP by 36.5, 44.3 and 27.4%, respectively (Table 2a). Except for the industrial sector, all the long-run elasticities for agriculture and services were found to be higher than their respective short-run elasticities. Therefore, it can be inferred that the impact of holistic reform programmes targeting agriculture and services sectors-non-oil sector, if well planned, executed and sustained will be more visibly in the long-run while impact of reform programmes targeting industrial sector will be more visible in the short-run. Table 2a. Unit root tests. Table 2b. Results of ECM showing short-run effects. Table 2c shows the diagnostic statistics results of the ECM model. The test of autocorrelation showed that the residuals were not serially correlated as indicated by the Breusch-Godfrey Lagrange Multiplier (LM) statistic which was not different from zero at 10% probability level (p>0.10), thus the acceptance of the null hypothesis of no autocorrelation. The Arch test results revealed that the variance of the current residuals and that of the lagged residuals do not correlate as indicated by the Q-statistic which was not different from zero at 10% probability level (p>0.10), thus the acceptance of the null hypothesis of no Arch effect. The stability test depicted in Figure 1 show that the Cusum line was within the boundary of 5% probability level, implying that there was no structural break in the equation: the model was not misspecified. Furthermore, the result of normality test showed that the residuals were normally distributed as indicated by Jarque-Bera statistic which was not different from zero at 10% probability level (p<0.10). Therefore, based on the outcome of the diagnostic statistics, it can be inferred that the ECM model used was the best fit and valid for prediction. Table 2c. ECM Diagnostic checking. Various combinations of the ARIMA models were tried after the first differencing of each variable series, and based on the smallest AIC value the best ARIMA model was selected. Of all the ARIMA models tested, ARIMA (0,1,1) model proved to be the best for almost all the variables except the Agriculture sector which proved that ARIMA (1,1,0) was the best given that it has the lowest AIC value (Table 3a). Table 3a. AIC and BIC values of different ARIMA models. Out of the total 22 data points (1990 to 2012), the first 17 data points (from 1990 to 2007) were used for model building, while the remaining 5 data points (from 2008 to 2012) were used for model validation. One-step ahead forecasts of the revenue for each variable along with their corresponding standard errors using naïve approach for the period 2008 to 2012 with respect to the fitted models were computed (Table 3b). Table 3b. One step ahead forecasts. The forecasting ability of the selected ARIMA models of revenue series for the economic variables were judged on the basis of R2, the mean absolute prediction error (MAPE), root mean square error (RMSE) and relative mean absolute prediction error (RMAPE) values. A perusal of Table 3c shows that the RMAPE of each variable is less than 10%, indicating the accuracy of the models used. Table 3c. Validation of models. One step ahead out of sample forecast of the revenue for the economic variables selected during the period of the year 2013 to 2024 have been computed. The absolute data points are shown in Table 3d and also depicted in Figure 2a-d to visualize the performance of the fitted model. A cursory review shows that the revenue of each variable would be marked by an increase, which is an indication of good prospect for the country economy. Under normal growth the forecasted trend will prevail; while under high and low growth the future trend of revenues for each variable will not exceed the upper and lower confidence limits, respectively. It can be observed from the forecasted results that agriculture will have the highest contribution to the country GDP with industry trailing behind. Under normal growth, the forecasted annual revenue growth rate for GDP, agriculture, industry and services will be 3.5, 3.6, 3.5 and 3.4%, respectively. In the case of high growth, the annual revenue growth rate for GDP, agriculture, industry and services are estimated to be 4.1, 4.7, 4.4 and 5.1%, respectively; and while under low growth, the estimated revenue growth rate for GDP, agriculture, industry and services sectors will be 2.8, 2.1, 2.3 and 1.0%, respectively. Therefore, since the country anticipated growth exceed the future outlook, onus lies on the stakeholders to implement sound policies to make the non-oil sectors main driver of the economy due to the low oil prices which leads to decline in fiscal revenues, vulnerability to slow global economic recovery and global financial development. Also, the overall impact of non-oil sector-GDP is relatively muted . Table 3d. Out of sample forecasts (Billion N). Figure 2a. Forecast of GDP. Figure 2b. Forecast of Agiculture. Figure 2c. 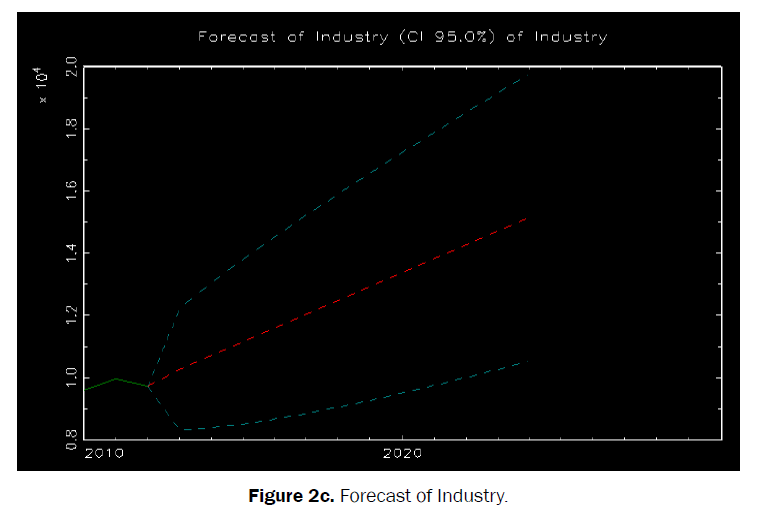 Forecast of Industry. Figure 2d. Forecast of Services. The model verification is concerned with checking the residuals of the model to see if they contained any systematic pattern which still could be removed to improve the chosen ARIMA. The results of the autocorrelation tests for each variable showed the residuals to be purely random as indicated by the Ljung-Box Q-statistics tests which were not significantly different from zero at 10% probability level. Also, the Arch effect tests showed no arch effects in the residuals as evidence by Arch-Lagrange multiplier (LM) test statistics which were not different from zero at 10% probability level. The normality tests for each variable showed that only the residuals of GDP and agriculture were found to be normally distributed as evidence by Jarque-Bera test statistics which were not significantly different from zero at 10% probability level (Table 3e), while that of industry and services sectors were not normally distributed. However, normality test is not considered a serious matter because in most cases data are not normally distributed. Therefore, these proved the selected model to be the best fit and appropriate model for forecasting. Table 3e. Diagnostic checking for best ARIMA models. This empirical research investigated the future outlook of Nigeria economic development in the light of slow global economic recovery and global financial developments using linear and symmetric price transmission mechanism model (ECM). The results showed that the residual of the OLS regression was stationary at level, indicating that GDP and the economy drivers are co-integrated. Furthermore, it was observed that the GDP established a long-run equilibrium with the all economy drivers, and corrects any deviation from the equilibrium that originated from any of the short-run equilibrium at a very slow rate per annum. Also, the economic parameters were found to exert positive influence on the GDP formation. It was observed that the future outlook of the GDP and the economy drivers will exhibit an increasing trend with the forecasted growth rate ranging from 3.4-3.6%. Therefore, in the light of the recent macroeconomic challenges, study recommends that government should adopt adjustment strategies that hinges on increasing non-oil revenues to compensate for the dwindling oil revenues because revenues from non-oil sectors can stand as the main driver of economy growth over the medium term. Granger CWJ. Some properties of time series data and their use in econometric model specification. J Econom. 1981;121-130. Blay JK, et al. Horizontal market integration and price transmission between maize, sorghum and millet in Dawanau market, Kano State, Nigeria: Evidence from non-linear vector error correction model. Global J Agricultural Economics, Extension and Rural Development. 2015;3:330-337. Singh IP, et al. Cointegration and causality: an application to GDP and major sectors of Nigeria. Int J Innov Res Rev. 2016;4:40-53. Sadiq MS, et al. Extent, Pattern and Degree of Integration among Some Selected Cocoa Markets in West Africa: An Innovative Information Delivery System. J Progressive Agric. 2016;7:22-39. Beag FA and Singla N. Cointegration, causality and impulse response analysis in major Apple Markets of India. Agricultural Economics Research Review. 2014;27:289-298. Mahalle SL, et al. Integration of wheat markets in Maharashtra. Agricultural Economics Research Review. 2015;28:179-187. Lama A, et al. Modelling and forecasting of price volatility: An Application of GARCH and EGARCH Models. Agricultural Economics Research Review. 2015;28:73-82. Sadiq MS, et al. Price transmission, volatility and discovery of gram in some selected markets in Rajasthan State, India. Inter J Environment, Agriculture and Biotech. 2016;1:74-89. Paul RK. Forecasting wholesale price of pigeon pea using long memory time-Series models. Agricultural Economics Research Review. 2014;27:167-176. Sadiq MS, et al. Strategy of minimizing the cost of cultivation vis-à-vis boosting farm income of small-holder maize farmers in Niger State of Nigeria using Efficient Measurement System (EMS). Indian J Economics and Development. 2017;13:728-734. Maddala GS and Kim IW. Unit Roots Cointegration and Structural Change. Cambridge University Press, New York. 1998. Gujarati DN, et al. Basic Econometrics, Fifth Edition. McGraw Hill Education, India. 2012. Maddala GS and Lahiri K. Introduction to Econometrics, fourth Edition. Published by John Wiley and Sons, Incorporation. 2013.